Looking for a crowd-pleasing main dish? You can't go wrong with a yummy Italian risotto! Many are heavy and calorie-laden with butter and cheese. 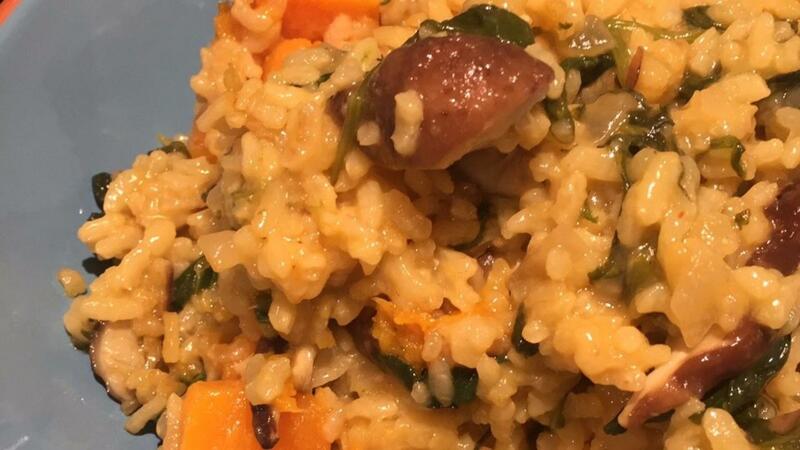 But it is actually the process of using Arborio rice and ladling in broth that gives it that chewy, creamy risotto texture. You won't even miss the dairy in this amazing recipe! This delicious comfort food meets the needs of many special diets. Preheat oven to 400 degrees. Place butternut squash cubes on baking sheet. Drizzle with a small amount of olive oil and sea salt. Bake for 15-20 minutes until cubes are slightly browned and tender. Remove from oven and set aside. Meanwhile, heat the vegetable broth and chopped mushrooms together in a saucepan until simmering. Then turn down heat and keep broth warm. In a large saute pan, add the olive oil and onion. Saute on medium heat until onions are soft, about 4-5 minutes. Add rice to the onions and stir. Add the wine and stir until wine has been absorbed into rice. Using a ladle, scoop out about 1 cup of broth from the saucepan, leaving the mushrooms in the saucepan. Add the broth and saffron to the saute pan with the rice and onion mixture. Stir often and simmer until the broth is absorbed. Continue adding about 1 cup of broth at a time to the rice, trying to leave the mushrooms in the saucepan until the end. Each time you add broth, stir and simmer until the broth has mostly absorbed. Continue until rice is al dente. On the last cup of broth, pour in the whole remaining broth with mushrooms into the rice mixture. Stir until broth is mostly absorbed. Then add in the baked butternut squash cubes and baby spinach. Stir to combine until spinach is heated and squash is fully combined into the rice. Remove from heat. Add fresh black pepper and sea salt to taste.